Lauren Fendrick, a member of Team USA’s beach volleyball team, recently visited our USYVL site in Hermosa Beach, California. 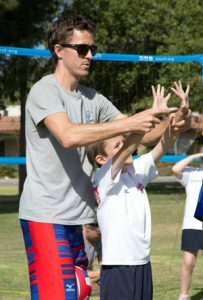 Fendrick, along with AVP Champion, Billy Allen, were able to instruct boys and girls on the fundamentals of volleyball. 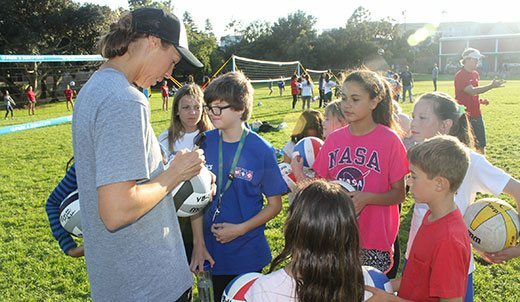 We always appreciate the time these Olympians and professional volleyball players give to the volleyball community. USYVL kids certainly love hearing and learning from players like Fendrick and Allen who have worked hard and achieved much in the volleyball world. For more on the story, check out KNBC in Los Angeles that published a story and posted a video on Fendrick’s USYVL visit and her preparations for the Olympics. Visit KNBC’s website here for the full story. Best wishes to Lauren in Rio this summer as she participates in the Olympic Games! Katie Ristow’s Volleyball Journey Started Here! From USYVL to NCAA; Katie Ristow’s Volleyball Journey Started Here! It’s not often one recognizes one of their earliest youth sports coaches some fifteen years later. Katie Ristow, the Marketing & Events Manager for Pepperdine University, experienced déjà vu when she crossed paths with USYVL Co-Founder Randy Sapoznik at the recent Pepperdine-hosted USYVL Kids Night. Ristow, a former Miami area volleyball champion and record-setting Outside Hitter for Division II Franklin Pierce University, got her start playing volleyball with USYVL. USYVL Co-Founders Randy Sapoznik and Dale Hoffman were Ristow’s coaches throughout her first season with USYVL, and Sapoznik quickly remembered Ristow, whose mother’s presence and support of the program stood out. Ristow, who initially turned to volleyball due to her advanced height at such a young age, recalls memories of the little extras offered by USYVL. “Being able to meet Dain Blanton after he won the gold medal during the Sydney Olympics was pretty cool! After Ristow completed her time with USYVL she went on to play in high school and club. When she was 16, her family moved to Miami, Florida, where she became a member of the Killian Sr. High School Varsity Volleyball team. Ristow excelled as the team’s starting Outside Hitter and was a part of a team that won the Greater Miami Athletic Conference in 2004. In 2005, Ristow and Killian Sr. High won the District and Regional Championships, going undefeated until the semi-finals of the Florida High School State Championships. 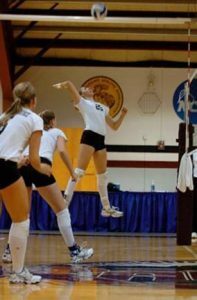 Ristow went on to start for four years as the Outside Hitter for Franklin Pierce University in New Hampshire, where she received her B.S. in Professional Sports Management and a minor in Marketing. While serving as a Graduate Assistant in the Marketing Department for Athletics at Florida International University (FIU), Ristow obtained a Master of Sports Management for Athletics. After a promotion to Assistant Marketing Director at FIU, Ristow moved back to Southern California and took on the Marketing & Events Management role for Pepperdine University. 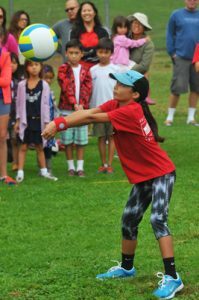 After receiving some tips from United States Youth Volleyball League (USYVL) kids, professional beach volleyball player John Mayer has won the first AVP event of the year. Congratulations are due to John Mayer and Brad Keenan for taking home the top trophy at the 2014 AVP St. Petersburg Open in Florida this past weekend. This marked the first AVP Tour win for Brad Keenan, and the second for John Mayer. In the story, there is an important message about persistence. John Mayer and Brad Keenan rebounded from a 21-15, 21-10 loss on the tournament’s second day to make the final through the contender’s bracket. On Sunday, they upset top-seeded and defending champions Jake Gibb and Casey Patterson 16-21, 21-19, 18-16. The win comes just two weeks after Mayer appeared at a USYVL “Pro Day” event. There he was able to interact with USYVL players. It is believed that the tips and enthusiasm Mayer picked up from the USYVL kids– most notably being advised to always score more points than the other team – helped him achieve this win. In all sincerity, Mayer’s fortitude as an athlete drove him to this win. It was truly an honor to have Mayer appear at a USYVL site. He signed autographs, interacted with the kids, and undoubtedly picked up a few fans. With this recent win, he will be a greater inspirational example of how continuing to put forth the best possible effort can yield positive results. Again, congratulations to John Mayer and Brad Keenan! Learning proper techniques from the outset can be important for many disciplines, and volleyball certainly is no exception. United States Youth Volleyball League’s (USYVL) proven teaching methods help kids develop proper form in a fun, supportive environment. 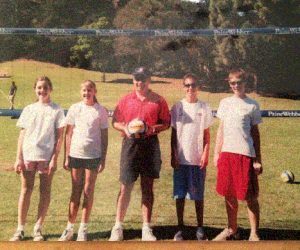 With Clinicians – our experts in volleyball instruction — at each site overseeing the teaching curriculum, ensuring that our coaches are utilizing the most effective coaching methods, the kids are given a proven system for success. There is nothing more fun than watching the joy kids have while they learn, and improve upon, their volleyball skills. Many of the kids in USYVL go on to play volleyball in high school and college. More importantly, all players take with them the spirit of teamwork and sportsmanship, which has benefits well beyond the boundaries of the court. Find out more about programs in your area. If you do not have a USYVL program in your community, and would like to help start one, give the USYVL National Office a call at (888) 988-7985. Click here to view the list of existing programs. Registration is open.